Holidays are often cited as a major contributor to the spread of influenza. Big families are breaking bread (and germs) together, flights (with their dreaded recirculated air) are more packed and popular than ever, and holiday sleeping and eating habits are not exactly designed for optimal immune system health. Interestingly enough, Kinsa illness data contradicts this theory. To determine whether holidays heighten the spread of flu, Kinsa reviewed flu data for school-aged children from the 2016-2017 flu season. While news and other data sources hypothesized a steady (or sharp) rise over the Thanksgiving and Winter holidays (weeks 47-48 of 2016 and weeks 52-1 of 2016/2017), actual Kinsa insights showed the opposite. 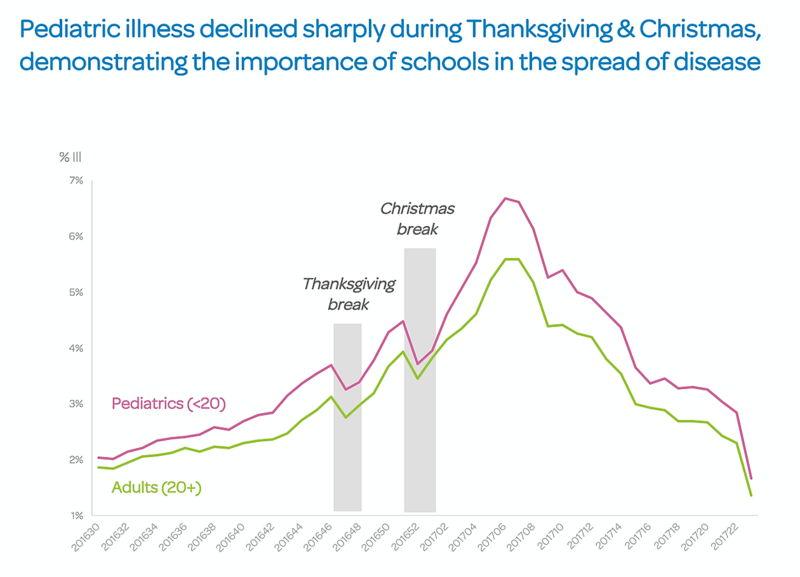 In fact, the data confirmed a significant drop in illness percentage during time periods that coincide with national school holidays. A group of researchers at Georgetown University believe that this recurring drop in influenza-like incidences (ILI) during school dismissals is due to “social distancing,” or periods of reduced exposure to populous, closed environments such as school and extracurricular activities. Influenza virus tends to incubate for 2 days before symptoms arise, then typically lasts for 5-7 days. CDC gets its data from clinical visits, meaning there is a lag of a few days from the time the population felt symptomatic to the time they actually saw a clinician. This trend is not specific to the U.S. In fact, many empirical studies have confirmed the effects of school closure on the reduction of ILI’s, predominantly using school breaks as a proxy for the potential impact of large scale school closures. In a highly publicized French study, researchers found that holiday breaks were responsible for a “20-29% reduction in the rate at which influenza is transmitted to children”. Similarly Chinese researchers studying influenza-like illness (ILI) in Beijing found school breaks in both Summer and Winter are associated with a significantly reduced number of ILI incidences in both school children and adults. There is no doubt that the flu is highly contagious. Also a “given” is the fact that school-aged children play a major role in the spread of influenza due to their high ILI rates, developing immune systems, exposure to other children, and longer period of viral shedding compared to adults. Schools are often considered the signal of an epidemic in the community. With vaccines being time sensitive and expensive to procure, school closures may be our best weapon in stopping a pandemic. The CDC recommends that students and staff stay home when sick until at least 24 hours after they no longer have a fever, but is this enough? The economic cost to society of shutting down schools for prolonged periods is great, with adults missing work or funding necessary backup childcare. The incubation period for flu is short, and those affected can infect others a day before they exhibit symptoms. As a result, levels of high absenteeism are not noticeable or reported back to public health officials until germs have spread. Surveillance systems currently relied on to give us an overview of emerging trends do not focus on ILI rates within closed environments such as schools, and do not provide real-time information for alerting administrators or public health officials of outbreaks. Contrary to popular belief and some sources of health information, incidences of illness dropped during holiday breaks in the 2016-2017 flu season. Despite differences in human behavior, ILI for school aged children dips during school breaks globally. Real-time school surveillance could be the most important preventative tactic for stopping the next influenza pandemic. With improved surveillance comes new insights. 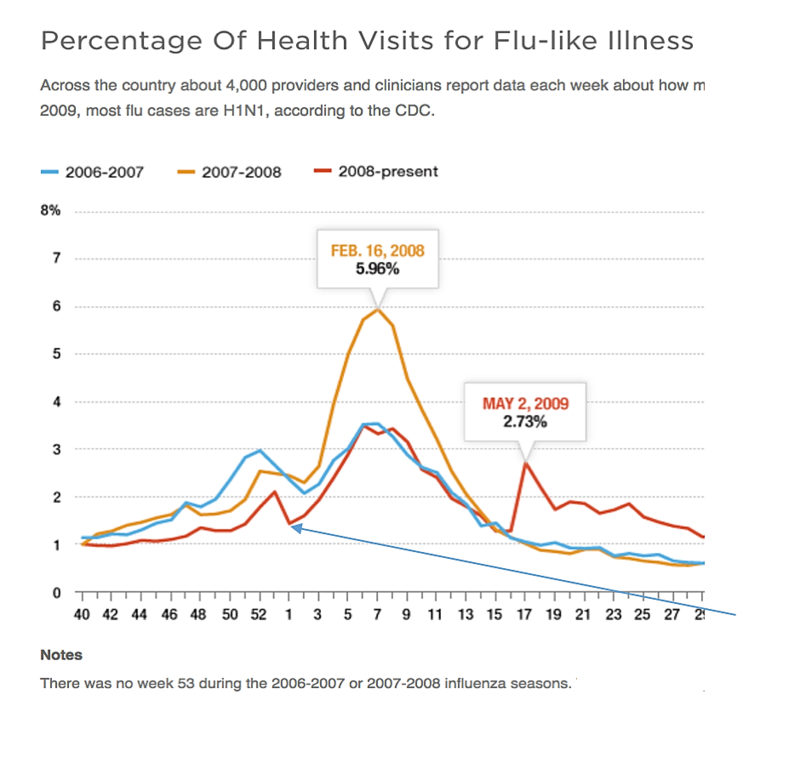 I’ll be posting these insights here and on our Kinsa Insights blog for those interested in following cold and flu trends.